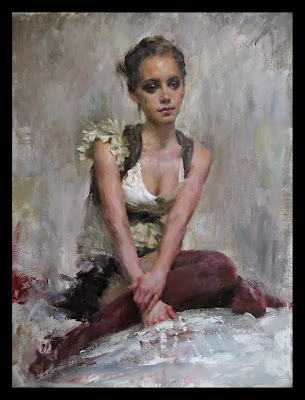 Back in September I shared my exciting experience watching artist Mary Qian's demonstration at Saks Galleries. If you missed it, you can read about it here. During that demonstration we watched her paint a model live in the gallery. We went back a few days after watching the demonstration to purchase one of her other paintings that I fell in love with, "An Innocent Gaze". Well, Mr. H really loved another painting, the one we watched her paint. The painting is titled "Ryann" which is the model's name. It is painted in more of an impressionist style than "An Innocent Gaze", with larger brush strokes. He loved the painting itself but he also really loved the fact that we got to watch it come to life, meet the model and have a real emotional connection to it. Mary said that the hands are the hardest part of the anatomy for her to paint because she wants them to look natural and real. They convey emotion and mood all by themselves and they are always the last part she paints. You can see in the photo on the left that the hands are unfinished even though the painting is almost done. I was really excited to see how she would paint them so I watched really closely and intently. I tried really hard to watch how she was going to do it but all I saw was a little shading here and a little shading there and suddenly there were fingers positioned so elegantly and naturally! It was so amazing to me. True talent! Mr. H loved the painting very much (and I liked it a lot as well) so we went back to the gallery and brought "Ryann" home. Here is the painting in our living room. I am so pleased with it and it looks like our cat Shifty loves it, too! We told Ryann the next time we have a party at our house we'd invite her so she could see the painting of herself in its new home. It truly is gorgeous Khammany! This is the beginning of a beautiful collection! What a great memory to have framed in your home. I am always so impressed that people have the talent to paint. It's a beautiful process to watch. She looks wonderful in your home! It is a beautiful painting, and what a treat to know its precise background. I hope you write it down and keep a copy attached to the back. Your collection is growing! What a lovely addition and memory maker too! You are becoming quite the collector of fine art! Pretty painting and loved hearing the story behind its connection! It is beautiful Khammany! What a lovley painting to have hanging in your home. Shifty has very good taste. Love the shot of Shifty gazing at the painting! It is so beautiful! And so special that you have it to remember such a neat experience you guys had together. Really lovely!! what a talent! I remember your first post about that painting very well. I'm so glad you now have it home, it's such a great experience to have seen it come to life and now to own it. And the picture with the cat watching it is so funny! I love both of these paintings very much. They are something I would like to have in my own home. It looks beautiful in your living room. Your husband has good taste, and I'm sure he is pleased with the painting. This artist is so talented. I just love paintings like this, and have a couple of paintings in my house as well. It is fabulous! How wonderful to acquire original art for your home. It is a blessing, friend! Hi Khammany - that is just beautiful & I love the story behind it. It looks great where you have hung it & I am sure you will enjoy it so much. I especially loved Shifty's appreciation of it !!!! That is a very lovely painting and you have a wonderful story to go with it. It will look marvelous in you home.